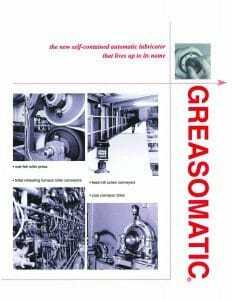 GREASOMATIC | Pro Chem, Inc.
GREASOMATIC reduces production downtime by lubricating your equipment while it is still in operation. This system is powered by a simple chemical reaction. Upon activation, the combination of galvin and electrolyte creates a steady release of hydrogen gas, which powers the piston to discharge the grease of your choosing. Each unit has a translucent window to monitor the level of lubricant. This system uses easy dial programming, with up to 7 output timing settings. Not only does the use of an automatic lubricator save money by reducing man hours, it prevents over and under lubrication problems related to manual lubrication. A small, precise amount of fresh lubricant is delivered at regular intervals directly to the lube point. This closed system prevents airborne contaminants from getting in the grease. Set time: Turn black control knob clockwise until white triangle points to time setting you want. Lock in time: Push red button down until it is level with yellow dial. Activate: Turn black control knob clockwise 10 or 12 times until it spins freely and you hear a clicking sound. Record: Enter replacement date on cartridge and in your records. Install: Pre-charge remote lines with the same grease. Screw GREASOMATIC into fitting until hand-tight. If you need to install remotely purchase the GREASOMATIC REMOTE SETUP KIT. 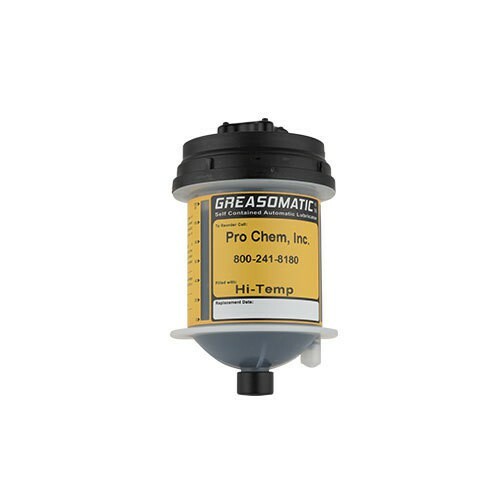 GREASOMATIC KIT: Improve safety by remote mounting the lubricator up to 6 feet away. *To install remotely you will need the Greasomatic Kit.